Change requires even more communication than routine activities. Top leaders need to know what's happening in the field. . . . Local units need role models to learn from the experience of their peers. . . . Change can be chaotic without a way to communicate what's happening everywhere. Rosabeth Moss Kanter, E-volve! Succeeding in the Digital Culture of Tomorrow, p. 235. Every day people throughout the world communicate with one another. These communications occur in ballrooms, boardrooms, back rooms, and even backyards. Consider a parent who has a long talk with a teenage child about the dangers of smoking. The teen listens attentively and asks questions. Parent and child begin a dialogue with a free exchange of opinions. The teen even agrees with the parent that smoking is bad for you. Two days later the kid comes home reeking of stale cigarette smoke. What the heck happened? You were clear in your explanation. You described the dangers of smoking and its consequences. You answered the kid's questions. What the heck did you do wrong? As a presenter, you did fine. As a parent, you failed to gain agreement and discuss the consequences of failure. The relationship between parent and child is not the same as that between presenter and audience, but there is a parallel. As the presenter, you are the expert, "the parent of the information." The audience receives your message; it is "the child of the information." Unless some kind of transformation, or change, occurs, the message will go in one ear and out the other. You as the parent need to give the audience something to remember and something upon which to act. In short, you need to lead. As the parent, you need to gain the child's agreement to stop smoking and list the consequences of failure to do so. As a leader, you need to gain agreement from your audience and imply the consequences, good and bad, that can occur when the people in the audience follow your message. Successful leaders are those who take information and give it meaning, or knowledge, that others can use. When this occurs, the message sticks (see Figure 11-1). Whether it is Jack Welch at G.E., Colin Powell and George C. Marshall with the Army, or Vince Lombardi with his teams, a leader makes sure that people understand what the leader is saying and, better yet, understand what they need to do with the information once they have it. Ensuring the viability of a message begins with an understanding of what the leader said. 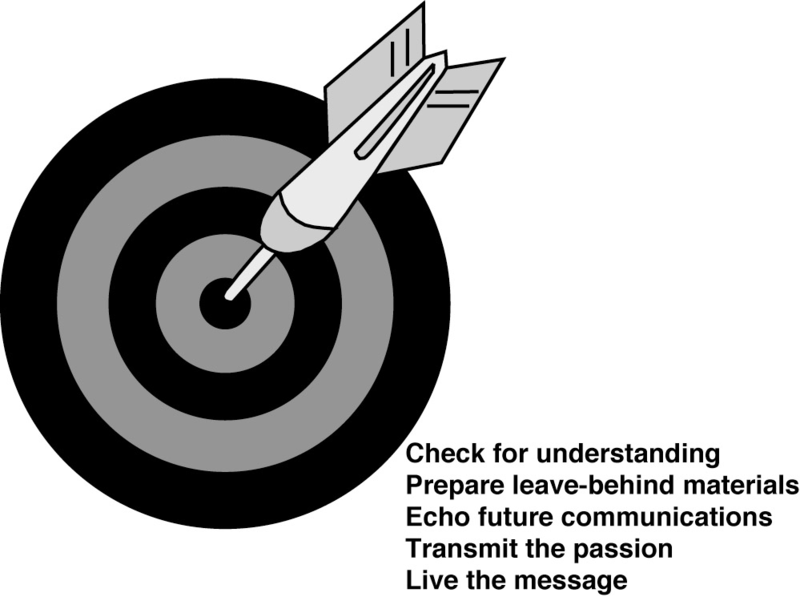 The focus of this guide has been on the active process of communicating - speaking, writing, delivering, and planning. However, while it is true that communications is an active process, it is also true that much of communications involves the leader's pausing to check for understanding. Leadership communications is a two-way process, and leaders must listen to what their people are saying. It is not enough to deliver the message; it is also important to determine how people are receiving it. Furthermore, communications involves retaining the message, with the implication that something is done with the information received. Depending upon the situation, one, two, or all of these methods may be applicable. The most important check of all, however, lies with the leader. The leader must be willing to listen. And listening can be difficult, especially when the leader has heard the complaint or situation before. In addition, many leaders are busy; they have a million things on their to-do list. Listening to others is rarely an action item. But in the long run, it may be the most important action step of all. There are additional things that leaders can do to ensure that their message echoes beyond their physical presence. Mother Teresa collected some of her thinking into books of prayers. Colin Powell and Rudy Giuliani wrote books reflecting their leadership values. Harvey Penick collected his thoughts in a series of small books. Rosabeth Moss Kanter is a prolific author on the impact of change on management and culture. In their writings, as well as their television or video appearances, these leaders are extending their message, increasing the likelihood of its being understood. Your presentation is composed of words and possibly images. Most important, it contains you. Your challenge is to leave a little bit of yourself behind as a means of furthering your message. Make a copy of your presentation and offer it to the audience. Or, if that is not possible, post your presentation on a web site so that others who did not hear it can access it. Keep the lines of communication open. You have spent a good deal of time preparing for your presentation. You should get something in return for your investment. Position yourself as an expert and strive to reappear periodically. This is a good tactic for sales presenters, but it is also useful for anyone who believes in what she or he does and wants to communicate a point of view. Shelly Lazarus has positioned herself as an eloquent spokesperson for the advertising industry as well as for the role of women in senior management. She speaks frequently to the media and to public audiences about her views, and as a result she has established herself as a credible source. In addition, she serves as a positive role model for the people in her organization as someone who lives by the values she espouses. How do you know when the message is getting through? It's getting through when the intent of the message is fulfilled! Sometimes it's pretty simple to tell this. For example, if you are the leader of a customer service department and your call to action specifies that people answer the phone by the second ring, you know that the message is getting through if people do this. If you are involved with an organizational transformation that involves behavioral change, that change will come slowly, possibly taking years. As with all calls to action, however, the leader must ensure that people have the tools and resources they need in order to perform. If you are asking service technicians to fix a vehicle the first time it comes into the repair shop, but you do not provide the right tools, then you are not following through. Likewise, if an organizational transformation requires employees to take more responsibility or exert front-line leadership, and your organizational hierarchy prevents any sharing of authority, nothing will happen. Rich Teerlink is candid about the challenges he and his team faced throughout Harley-Davidson's organizational transformation. His leadership team tied communications to the business process and by so doing was able to gauge the results of communications in terms of the implementation and outcome of business objectives. Again and again, there were snags over a variety of different issues, including organizational systems, cultural values, and especially compensation plans. The leadership had to persevere and to use communications to drive the transformation home. Communications at Harley was not simply telling people what to do, but, very importantly, asking them for their ideas and creating a culture of learning in which best practices could be shared among groups. Change is never easy. What can assist the process and give it the impetus to succeed is a leader who is willing to communicate the goals and to listen to other ideas as the organization moves slowly and steadily onward. As a leader-communicator, it is imperative that you live your message, i.e., that you walk the talk. What can happen when leaders fail to perform in accordance with their words can be disastrous. The sexual abuse scandal that has swept through the Roman Catholic Church is a sad example of what can happen when the values of the organization do not match the actions of its members. Although cases of priestly pedophilia had been well documented for decades, the Catholic hierarchy, chiefly the bishops, took no public action. Rather than turn the predatory priests over to the authorities, they simply transferred them from parish to parish, enabling these disturbed adults to continue their molestations. They extended this same veil of protection to homosexual priests who had abused teenage boys. The crisis came to a head in the Boston archdiocese in early 2002, when it became public knowledge that Cardinal Joseph Bernard Law had been a prime mover in protecting some of the most heinous of these pedophiles. Law's actions demonstrated that the Church was more concerned with protecting its own than in ministering to its victims. Only after repeated badgering from the media did Law and other members of the Catholic hierarchy acknowledge how hurtful they had been to the victims of abuse. Law ultimately resigned under great pressure. Similarly, we have witnessed another spectacular fall - that of the celebrity CEOs who placed their own well-being above the well-being of their employees and their shareholders. To be sure, the overwhelming majority of CEOs are decent and trustworthy, but the examples of John Rigas at Adelphia, Dennis Kozlowski at Tyco, and Bernie Ebbers at WorldCom cast a negative light on all business executives. Their excessive greed cost shareholders billions. These negative examples, however, did have positive outcomes as a result of the news coverage of the scandals. A more informed Catholic laity insisted on zero tolerance for abusers. A more informed investment community insisted on stricter standards of corporate governance. The effectiveness of a leader depends upon the trust of those who follow. Leadership communications reinforces that bond on a regular and frequent basis. So what can you do to ensure that you live your message? As an executive, you must conduct yourself for the good of the organization and make choices that are right for employees, for suppliers, and for shareholders. As a professional (e.g., physician, attorney, or accountant), you must embody the principles of your trade and treat people fairly and honestly. As a teacher or coach, you must set the rules and enforce them for everyone for whom you are responsible. As a parent, you must live for your children, doing what you can to promote their physical, mental, and spiritual development. You can think of many more examples for yourself, but what it comes down to is this: Walk the talk. Lead by example. You want the audience to remember you and your message. The ways to ensure that you and your message live on are as varied as your imagination. Here are some ideas to get you started. Look for opportunities to speak to the audience again. Follow up in a week to see how your presentation was received. If it was received well, offer to keep in touch. Develop ways to keep in contact with the audience after you leave. Develop your collateral materials, e.g., brochures or mailers. Keep your web site active. Email new information to your key clients every 6 weeks or so. How do they lead with their words (e.g., communications)? How do they lead by example? What leadership traits of these leaders would you like to emulate? Read biographies of leaders. Look for examples of how they used their communications, including presentations, to get their message across. Julius Caesar wrote history and was an accomplished orator. Franklin Roosevelt calmed a worried nation with his fireside chats. Martin Luther King used rhetoric and stories from the Bible to inspire. Create your own definition of leadership. How would you communicate that message to others? It may be a first for a professor who holds a prestigious chair at the Harvard Business School, but for Rosabeth Moss Kanter, it was a logical step - to synthesize her message into a rap song. Kanter has been writing, teaching, and consulting on change for more than two decades. "Why not take this [rap music] and turn it to a positive social purpose - to reclaim this genre from the gutter and elevate it to something that can inspire?" Kanter sees parallels between hip-hop and the corporate world. "I began to realize that the messages about the culture of business were just as good reaching down into the community. Like the line [in the song] that says, ‘Don't get trapped in old divisions on a patch of tiny turf.' I had in mind both the turf battles that go on within bureaucracies and gangs on the street.'" Through her 15 books and more than 100 articles, Kanter has been charting bureaucratic machinations and internecine corporate wars since the 1970s, when American businesses were hierarchical and those at the top ruled with the mindset of "my way or the highway." Today the landscape of American business is global, and the hierarchical systems that worked so well in a command-and-control economy are seen as dysfunctional. Organizations operating within this landscape need to evolve new models, new ways to adapt to change. And that's where Kanter comes in. Change is hard work. It takes time. We talk about "bold strokes" versus "long marches." Bold strokes are when leaders issue edicts - to open or close a department, say. But building and creating things of value - that takes long marches . . . and a lot of people volunteering to be followers. The issue is to create the conditions that enable companies to take advantage of the good ideas which already exist, by taking better advantage of the talents of their people. By encouraging innovation and entrepreneurship at all levels, by building an environment in which more people feel included, involved and empowered to take initiative, companies as well as individuals can be masters of change instead of its victims. Kanter is a strong essayist. As a former editor of the Harvard Business Review, she knows how to make a point succinctly so that readers, who are probably busy managers, can grasp the basics quickly. In the preface to On the Frontiers of Management, she calls the collection of her articles "an agenda for managerial work." She continues, "Taken together, [the articles] reinforce a single, timeless message: the importance of providing the tools and conditions that liberate people to use their brainpower to make a difference in a world of constant challenge and change." In her essay "A Walk on the Soft Side," Kanter addresses the inherent difficulties that managers have in dealing with the people side of business. Communications is essential, but in a cross-cultural environment - or today in alliances across companies - open communications can be a genuine challenge, one that leaders as communicators must address. "Leaders still need to listen, carefully, and they need to open the channels for others to talk, listen, contribute, and reflect." Such communications opens the door to organizational learning, allowing people throughout the enterprise to share best practices. In this same article, Kanter speaks of American managers' predisposition to "self-disclosure" - something that their counterparts in Asia and Europe do not have. Open communications thus raises the stakes for leaders: It discloses their shortcomings along with their successes. Yet it is only through collaboration, involving communications, that change can occur. As Kanter writes in another essay, "[T]he best way to lead change is to create conditions that make change natural." Managers in organizations where change is part of the culture "release the potential of their people to create the future." Kanter's message of empowerment through change, enabling people to think and do for themselves as they turn change into an ally, has earned her many honors - she is a best-selling author, and she has valued consulting relationships, honorary degrees, and multiple leadership awards as well as recognition outside her realm. The Times of London named her "one of the 50 most powerful women in the world." As a result, Kanter is an extraordinary leadership communicator, one who lives her message through her writing and teaching as well as consulting for both for-profit and not-for-profit enterprises. Since Kanter is someone who has concentrated on organizational change, it was only a matter of time before she would explore the revolutions wrought by the Internet. When her book on the topic, E-Volve! Succeeding in the Digital Culture of Tomorrow, appeared in 2001, the bloom was already off the trend and dot.coms had become another word for "out of work" or, worse, for an elaborate con game. Even Kanter, a veteran trend observer, was surprised: "I've lived through many cycles of enthusiasm for something that gets excessive, swings too far, and all of a sudden is trashed, and then finally it gets incorporated appropriately . . . but I have never lived through a cycle where things turned on their heads so fast." While critical of some dot.com excesses, Kanter believes "E-volve! has enduring lessons about change, and it points the way toward key elements of how you run your company differently because it is on the Web, or simply because other companies are." Like her other works, E-volve! provides case studies of successful e-enterprises, coupled with survey research. From her studies she has distilled several lessons. One is the nature of e-culture itself. She does not mince words: "E-culture is not lipstick on a bulldog; it is a fundamentally different way of life . . . not just new wardrobe [casual clothes] . . . or a little redecoration." Under her "requirements of change," Kanter cites the need for improvisation, the need for partnership networking, and the use of "customer power" as an agent of community building. She redefines "competition for talent" as an avenue for "empowerment" as well as providing a means for employees to learn to do for themselves and to be compensated financially as well as through the values of being part of a larger community. It is in the people part that Kanter returns to her roots as a change agent. Citing the "star performers" in her book, those men and women who not only have adapted to e-culture but are adapting it, she posits "seven qualities of the mind" that are necessary in order to "e-volve." All of these qualities are timeless. "Curiosity and imagination," "communication," and "sensitivity to the range of human needs" are qualities that are familiar to many. What is different is the need for managers to be "cosmopolitan" and to possess a "grasp of complexity" in order to divine a new culture that takes "conflicting points of view into account." In points six and seven, Kanter gets to the heart of what it means to be a manager in today's world. Successful managers will "work with other people as resources not as subordinates" and "lead through the power of their ideas and strength of their voices" rather through position and rank. In short, as Kanter says in an interview, "So my ultimate message is that we need leaders who react to change with curiosity, not denial. We need leaders who empower people - empower them to do the work better, to rethink how the system is designed . . . and who make value choices to use technology to benefit rather than to isolate and dehumanize people." According to Kanter, there are four keys that ensure understanding: "simplicity, consistency, repetition, and demonstration." Simplicity emerges from a "clear but simple message that is meaningful [as well as] understandable and motivational." Consistency occurs when "all communications and all actions tend to reinforce the same message." Repetition is necessary "because people never believe it the first, or even the second and third time." Demonstration comes when leaders "[u]se stories and examples from within the company to make the message tangible and concrete. People remember stories." Leaders owe it to their people to keep their messages fresh. "If the basic message - such as mission, vision, values - still fits, then make sure it is communicated in terms that will capture people's attention as well as their imaginations." Again, stories are a good way to reinforce the basic message. When circumstances change, leaders must alter their messages. "[D]o a relevance check to see if the message still fits the circumstances. . . . If [it does] not, look for a better way to understand and communicate the challenges facing the organization and the actions required." When it comes to addressing bad news, such as a corporate governance crisis, Kanter is direct. "Face the facts, and face the music. Communicate to all constituencies right away - otherwise any messages sound defensive and reactive. Identify actions to solve the problem, and announce them, even if they won't start right away. Then keep communicating, with frequent updates on revelations and progress." Keeping things quiet is not a viable strategy: "As we all know, cover-ups or silence often have worse repercussions than the original sin." As for the hip-hop scene, Kanter has discovered a new audience. After she plays the song for Harvard alumni and business conferences, she says, "People really go crazy. Parents want to play it for their kids. And the kids themselves, they look at me with new respect." Self-esteem aside, what Kanter is really doing is serving notice to those in the next generation that if they expect to succeed, they, too, must continue to learn and to innovate - in other words, to change. Advocate for change. Change is an uncomfortable process. Throughout her life's work, Kanter has nudged, cajoled, and pushed organizations to find better ways of changing in order to find better ways to function and succeed. Draw analogies. Find parallels with other businesses. Kanter has consulted and studied a great many organizations in the course of her career, and she draws lessons from each that she shares in her writings. Share the learning. Leadership is about doing for others. As a teacher, Kanter shares her expertise with her students. She is also active in community affairs, from which her CD rap project emerged. Live your message. In her work, Kanter has been consistent and constant in her messages about learning new ways to adapt to a rapidly evolving workplace in order to create a better workplace. Rich Teerlink and Lee Ozley, More than a Motorcycle: The Leadership Journey at Harley-Davidson. James Verini, "Harvard Professor Has Some Rap," New York Observer, July 30, 2001, p. 21. David O. Webber, "E-volving with Rosabeth Moss Kanter," Health Forum Journal, January/February 2002, pp. 10-15. Rosabeth Moss Kanter, The Change Masters: Innovation and Entrepreneurship in the American Corporation (New York: Simon & Schuster, 1983), p. 363. Rosabeth Moss Kanter, On the Frontiers of Management (Boston: Harvard Business School Press, 1997), p. xiii. Rosabeth Moss Kanter, "A Walk on the Soft Side," in On the Frontiers of Management, p. 165. Rosabeth Moss Kanter, "Introduction," in On the Frontiers of Management, p. 26. Rosabeth Moss Kanter, E-volve! Succeeding in the Digital Culture of Tomorrow (Boston: Harvard Business School Press, 2001), p. 352. Melissa Master, "Rosabeth Moss Kanter Says She Wants an Evolution," Across the Board, September/October 2001. Webber, "E-volving with Rosabeth Moss Kanter," pp. 10-15. Jerry Useem, "Rapping for Managers," Fortune, Sept. 3, 2001.